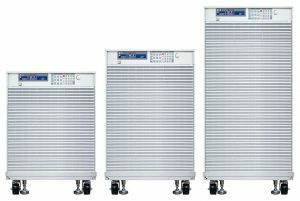 The 5VP Series consists of high power load cabinet systems with support for 60V, 600V, 1000V or 1250V input ranges. All loads share a common and intuitive user interface. 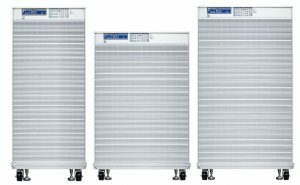 The 5VP Series are highly efficient integrated DC load systems that operate from a single user control panel or remote control interface. 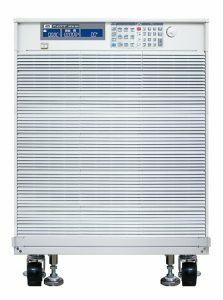 There are 28 different 5VP Series models ranging from 5kW to 60kW. For higher power requirements, 5VP models can be paralleled easily. One 5VP MASTER load can be paralleled with up to seven other 5VP DC Loads in SLAVE mode. 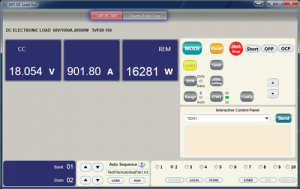 All controls and total power and current measurement is done by the MASTER load. 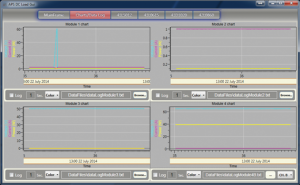 NEW: Current Waveform Generator Option for DC Loads. This optional arbitrary waveform generator option allows creation of very specific current waveforms using included Windows software or by capturing real world current waveforms on a digital scope. See Models and Features tabs for details. For questions regarding the 5VP Series DC Loads, please contact us. The Adaptive Power 5VP Series loads are intended for very high power DC test and product development applications in a wide range of industries. The 5VP Series models support voltages to 60V, 600V or 1000V and are well suited for testing large battery systems, high power AC/DC converters and energy storage systems found in Solar and Wind power applications. Their flexible V-I operating curves span range of voltage and current combinations at high power levels. All 5VP Series models have a low range mode for enhanced accuracy and resolution at lower voltage and current levels, further increasing their effectiveness. The 5VP Series consists of a total of 34 different models providing a wide variation of possible voltage, current and power combinations. The 60V 5VP and 5VP50-xxA and 5VP60-xxA DC loads can be paralleled with other identical model loads in a MASTER/SLAVE configuration. For all other 600V and 1000V 5VP DC loads, different 5VP power level models can be paralleled in MASTER/SLAVE mode. Up to 8 loads can be paralleled this way for a maximum load rating of 480kA (8 x 5VP60-60). Note: Older generation non-A version 5VP DC Loads do not support MASTER/SLAVE mode. The “A” models are backward compatible with non-A version 5VP Loads. Current Waveform Generator (Opt CWG): This plug in module is available for 5-Series and 5VP-Series DC Loads and provides arbitrary current waveform programming. 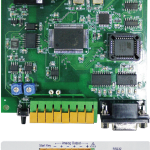 All APS 5VP Series Loads are equipped with a powerful micro controller and user friendly controls to provide capabilities that cover a wide range of load applications. Precision metering of Voltage, Current, Power and Resistance is standard. Elaborate testing of linear and switch mode AC/DC power supplies at high speeds is made possible by flexible ranging and wide V-I operating curves found in all 5VP Series APS loads. This supports high throughput production test and burn-in of small and large AC/DC power supplies. Time sequencing of specific discharge current levels as a function of battery voltage allows characterization and performance testing of various battery chemistries. 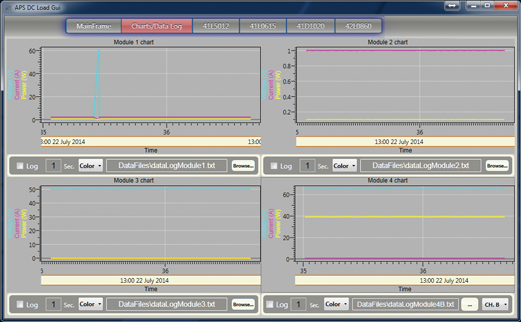 The high current resolution and accuracy of the 5VP Series load supports testing of both small and large batteries. MASTER/SLAVE parallel configurations up to 480kW are available. 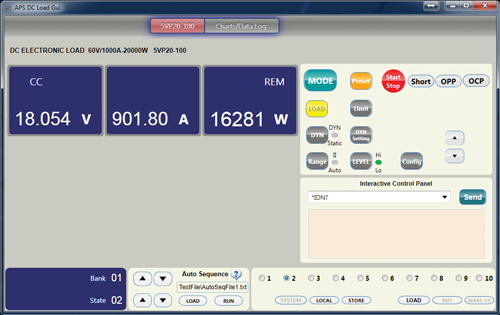 The maximum power point tracking function of the 5VP DC loads simulate the behavior of a solar inverter allowing solar panel testing under a variety of conditions. 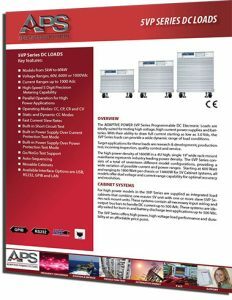 All 5VP Series loads are supported by the APS DC Load Control windows software.